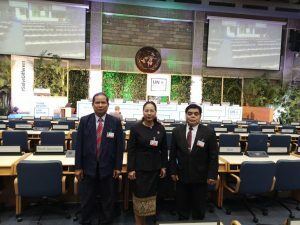 Lao delegates attended the Fourth Session of the UN Environment Assembly (UNEA-4) in Nairobi, Kenya from 11-15 March, 2019. “an ambitious, universal implementable and realizable Post-2015 Development Agenda” that integrated all the dimensions of sustainable development for “the protection of the environment and the promotion of inclusive social and economic development in harmony with nature”. Followed by third Environment Assembly under the overarching theme “Towards a pollution-free planet” in 2017 and the Fourth Environment Assembly focusing on the theme “Innovative solutions for environmental challenges and sustainable consumption and production”. At conference, delegates shared their national actions and experiences of implementing solutions to SCP, discussed progress within the region on attaining the Sustainable Development Goals (SDGs), and provided their perspectives on draft UNEA resolutions which addressed issues such as marine plastic waste, ecosystem protection, sustainable infrastructure, dust storms, and waste management. During the ministerial segment, they took part in two high-level panels addressing policy support and financing, respectively. Lao PDR reaffirmed strongly commitment in implementing the result of this assembly, which addressed in the statement of Madam Vice Minister to the Ministerial Declaration including six commitments, the GEO 6 and SPM key messages in addressing and overcoming present and future challenge and adopted 11 resolution and 3 decision and informed the participants about the policies, vision and the development plan of Lao PDR and making further collaborating with the world’s community, by set up the coordinating mechanism on natural resources management and environmental protection at the macro level as well as laid down legal framework, policies and long term strategies by mainstreaming into its immediate and long-term national socio-economic development plan into the green sustainable development at the national and provincial levels. 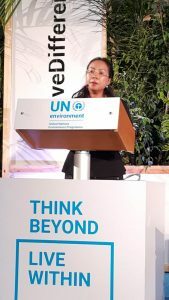 In her statement, she also informed the participants that, Lao PDR is the first country to host a joint mission national workshop of the Green Climate Fund (GCF) and the Global Environment Facility (GEF) to ensure complementarity and coherence in its programming plans for supporting the ambitious climate action, green sustainable development by targeting to reduce the environmental issue in Lao PDR. The Assembly will be conducted until March 15 to consider the Ministerial Declaration at the UN Environment Assembly and “One Planet Summit” theme on Environmental challenges related to poverty and natural resources management, including sustainable food systems, food security and halting biodiversity loss; and Innovative sustainable business development at a time of rapid technological change.